Need to find a pet friendly hotel in Starksboro VT? Click the Pet Friendly Accommodations Button below!" We have pet information for all the world's airlines, plus information on travel by ship, train, bus and car. Find nearly 57,000 pet friendly accommodations in 5,000 cities in 147 countries around the world where your pet is welcome. 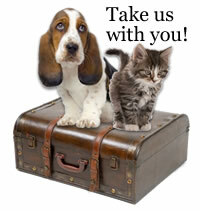 It's easy to find dog or cat pet friendly hotels in Starksboro with PetTravel.com. Click the SEARCH PET FRIENDLY ACCOMMODATIONS button above for a list of pet friendly hotels, motels, bed and breakfasts, small inns, and vacation rentals in Starksboro. You can even book your reservations on the same page! Be sure to mention PetTravel.Com when you make your booking.